The Door Industry Journal: What Should be in your Health and Safety Toolbox? Every year, workers in the construction industry are injured as a result of their work, some even resulting in death. While there have been big improvements made over recent years, clearly more can still be done to keep employees safe. With National Health and Safety Week (20-24 June 2016) just around the corner, Carrie Earle, category manager at IronmongeryDirect, takes a look at some of the latest tools available that have been designed to improve safety for trade professionals and reduce the risks of common work-related injuries. Trade professionals working within the construction industry are regularly tasked with improving the safety of a property or building, but how often do they actually consider their own health and safety? Despite fatal injuries being at their lowest in 20 years, non-fatal injury cases are on the rise. According to the latest statistics from the Health and Safety Executive (HSE), in 2014/15 in the construction sector, 69,000 workers were suffering from a work-related illness and 65,000 non-fatal injuries to employees were reported. Construction and building work remains a high-risk activity as the role can present various workplace dangers; from lifting heavy objects to using machinery or vehicles. As well as affecting employees, workplace injury and ill health can cost businesses a lot too, so it’s vital that business owners have stringent measures and procedures in place to not only protect their staff, but also their company. Regular risk assessments can help to identify any hazards associated with the work, so action can then be taken to put in place measures that will reduce the chance of an incident occurring. Effective management of work activities and competent site supervision are essential in maintaining good health and safety standards. For trade professionals tasked with potentially hazardous jobs, employers are legally required to supply them with suitable personal protective equipment (PPE) that can help to protect against possible injury or illness, such as eye protectors or gloves. 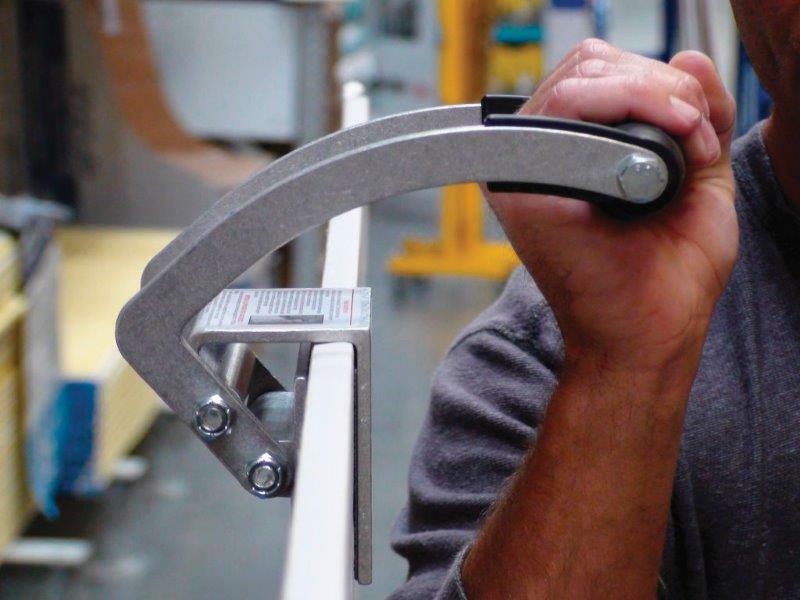 Alongside this essential equipment, there are also handy tools available that can make the job safer and prevent common injuries from occurring. One regular cause of injury comes from lifting and moving heavy objects, a task often undertaken by trade professionals. Fortunately, there are a number of new devices on the market, which can help take some of the weight and make lifting safer and easier. The Roughneck Gorilla Gripper is one such product that has been designed to grip, lift and carry heavy materials such as doors, large sheets of material and worktops. It removes the need for a tradesperson to bend or lift, therefore reducing potential injury to the back, wrist or fingers. 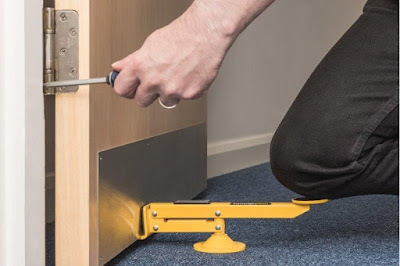 Another tool which helps make lifting easier is IronmongeryDirect’s Door and Panel lifter. The robust tool, made from high-grade steel, helps to lift doors up to 75kg, meaning tradespeople do not need to bear the brunt of the weight. The tool also makes hanging a door a quick and easy process as it enables one person to do a two-man job. Air pollution is another risk to consider when working in the construction sector that can cause illness. For example, sanding paint or wooden objects, such as doors, can create a lot of fine dust that can be easily inhaled and irritate the respiratory system, or can get into eyes. The dust may contain hazardous substances too, which could be extremely harmful if inhaled or ingested. To overcome this problem, the Mirka Abranet Dust Free Sanding Kit has been designed to allow users to experience dust-free sanding as the hand sanding block can be connected to a dust extraction system using a hose, allowing for a healthier working environment. This also helps to dramatically reduce clean up time. The construction sector, as with other high-risk industries, can present a number of hazards depending on the job being carried out. However, with strategic planning and effective risk assessments in place, employers are able to consider the best solutions to keep the risks to a minimum. Fortunately, there are various health and safety solutions available so employers can ensure that workers are not put in danger.